Washington D.C. born drummer Billy Hart belongs to that elite group of elder statesman jazz musicians who honed their craft during the mid-late 1960s as a sideman first with Hammond organ supremo Jimmy Smith and then guitarist Wes Montgomery. However, it was his tenure with the experimental Herbie Hancock sextet between 1969 and 1973 that first marked out Hart as a musician who was capable of going beyond both soul-jazz and bop genres and entering into freer territory, though always within a carefully controlled framework. Thus came notable sideman duties with both McCoy Tyner and Stan Getz before he debuted as a leader with the magnificent ‘Enhance’ on A & M’s offshoot jazz label Horizon in 1977, a mid-period career high point as a leader and on a par with the loft-inspired recordings of the same era. Fast forward some thirty-five years or more, and Billy Hart now finds him leader on a second album in relatively short succession on the ECM label, with a follow up to the well received 2011 outing, ‘All our reasons’. Hart has skilfully surrounded himself with a crack quartet that blends youth and seasoned experience with tenorist Mark Tenor, who spent part of the 1990s as a leader on the Blue Note label, the Bad Plus’ pianist Ethan Iverson and bassist Ben Street. 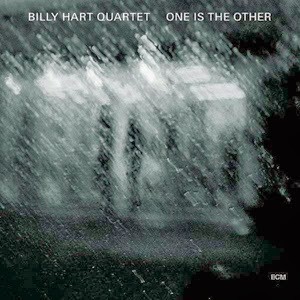 Indeed one could argue that Hart has come upon the ideal quartet sound here and there is an impressive collection of contrasting moods on the album with a highly inventive and frequent use of differing duets, ranging from conventional piano-saxophone through to more experimental drum-piano and drum-saxophone. Compositions are roughly evenly divided between saxophonist, pianist and leader. However, it is the latter’s ‘Teule’s redemption’ that is the stand out track and a truly haunting melody at that with a fine plaintive solo from Turner who sounds here like a marginally less aggressive mid-1960s Wayne Shorter and with delicate accompaniment from Iverson. The rapport between both Iverson and Turner and Hart and Turner is a recurring feature of the album with the former duo playing in unison on the lyrical ballad ‘Sonnet for Steve’ and the more experimental sounding ‘Maraschino’ and the latter duo operate on the initial gentle tranquillity of ‘Amethyst’ that remains pared down until Iverson re-enters to take a solo. Turner wails sweetly on the sole standard, the Rodgers and Hammerstein number, ‘Some enchanted evening’, evoking Stanley Turrentine in his prime with fairy tale-esque musings from Iverson while on his own ‘Lennie Groove’, the tenorist’s outwardly melodic tone has the faintest hint of harshness underneath that recalls Hank Mobley from his mid-late 1950s Jazz Messengers sojourn. If ‘Enhance’ represents a landmark recording overall for Billy Hart as a leader, this latest album is a prime contender for second place and that is testimony to the current quartet’s well oiled machine.